The bird life in and around Kingfisher Bay Resort is bustling at the moment and, as we move towards cooler seasonal weather patterns, we’ll start seeing our semi nomadic species like the White-breasted Woodswallows (Artamus leucorynchus) and autumn/winter migrants such as the Rufus Fantails (Rhipidura rufifrons) and the Cuckoo family using the pristine habitats of Fraser Island as a home base, if only for a short while. Whether you’re on a Ranger-guided tour, or just taking a relaxing stroll around the resort grounds, you can’t help but notice the sensational symphony of amazing bird calls. 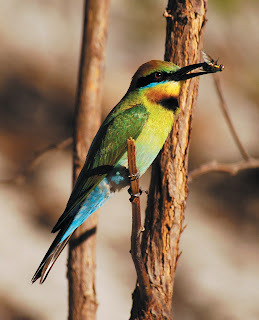 In particular, while walking around our Sand Bar bistro (near the western beach) and Wallum board walks leading from our Centre Complex and hotel buildings towards the shores of the Great Sandy Strait, one of the bird calls that is most frequently heard is a loud and repetitive ‘woik weet weet weet’. This is the call of the Blue-faced Honeyeater (Entomyzon cyanotis - pictured right) - an agile bird with olive-yellow colouration which blends very well in its chosen habit in our Wallum heath. Adult Blue-faced Honeyeaters have an identifiable light blue patch around the eye so you will be able to differentiate them easily from their juveniles, which predominately have yellow or green facial markings. DID YOU KNOW that the Blue-faced Honeyeater is one of the first birds heard calling in the morning, often calling 30 minutes before sunrise? 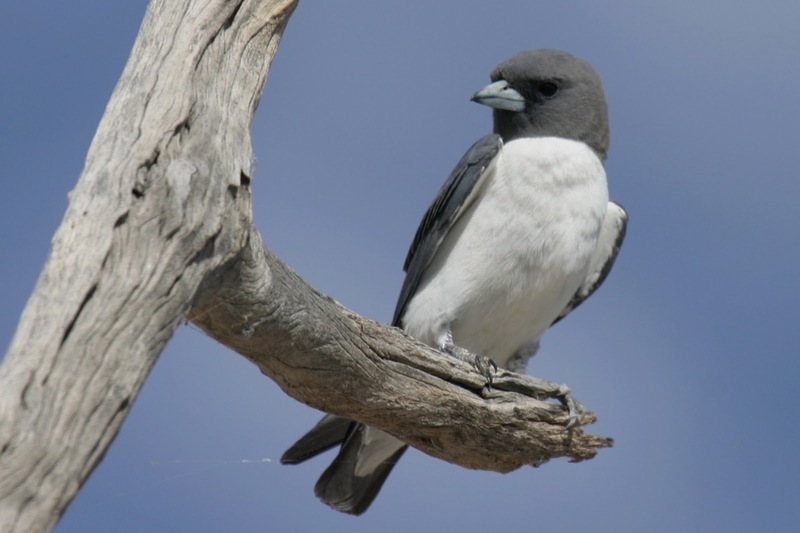 Another Fraser regular, the beautiful White-breasted Woodswallow, is a species that is often found around woodlands, wetlands and close to water and is the only one of the woodswallow species with no white colouring on its tail. This species’ distinctive features include a white chest which contrasts strongly with their definitive black cap and navy blue beak. White Breasted Woodswallows are quite social, and twitchers on Fraser Island have spotted these small flocks diving near the waters of the Wallum mirror lakes whilst feeding. 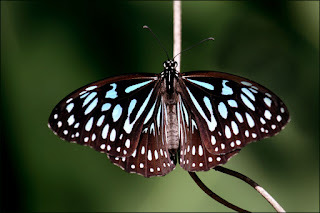 Being an insectivorous species – that is they have diet which consists chiefly of insects and similar small creatures - they are extremely agile in flight which provides some spectacular aerial manoeuvres. They are nomadic, moving northwards during the autumn and travelling south during the spring. This month, guests participating in our Ranger-guided Segway 'green machine' sessions along the beach have been fortunate enough to observe a gaudily coloured small bird chirping and flitting from branch to branch in the golden afternoon sunlight. This bird is one of our favourites in this blog, the Rainbow Bee-eater (Merops ornatus - pictured right) and is identified by its lovely green back, beautiful blue rump and jet black tail. A really interesting fact about these birds is the way they nest - the male makes a burrow in the dune cliff face by hovering over one spot and scratching the sand away with his claws. If the female doesn’t like the burrow she will reject that site, which forces the process of construction to begin again for a successful mating to occur. As we head towards winter we look forward to gorgeous sunny days on Fraser, cooler nights and plenty of fantastic bird watching on Fraser Island. Who knows, we may just spot the 355th species of bird on the island – watch this space. And if you're interested in reading about some of our largest migrating visitors, head over to our Life on Fraser blog. Until next time, happy twitching folks. April/May has been a mixed bag for us in terms of the weather and wildlife that we have seen out and about on Fraser Island. 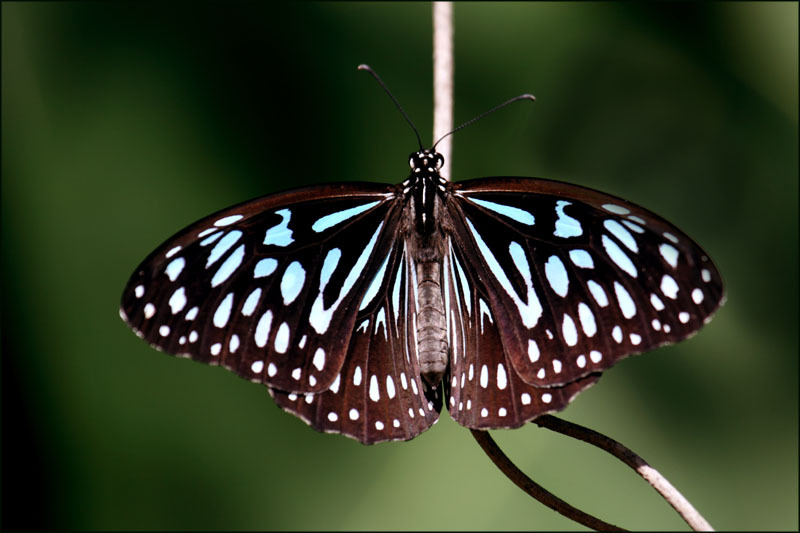 At the moment, guests heading across island to 75-Mile Beach can’t help but spot our migratory ‘Blue Tiger’ butterflies (Tirumala limniace - pictured left), which seem to be everywhere and are easily identified by their brown wings with baby blue spots. Closer to our home base at Kingfisher Bay Resort, guests on our night walks over the past few weeks have been in for a treat as some of Fraser Island’s cutest marsupials – our Sugar Gliders (Petaurus breviceps) – have made cameo appearances in the trees in and around Kingfisher Bay and, in particular, near our treetop villas. The Sugar Glider (pictured below left) is a very small, but amazing little animal that makes their home in the tree tops and tree hollows in wet sclerophyll forests (that is, forests with an open canopy of tall eucalypts such as Rose Gum and Turpentine). Sugar Gliders are marsupials – that is they carry their young in a pouch called a marsupium – and, as the name suggests, have an amazing ability to jump and glide up to sixty metres. It is this gliding ability which actually distinguishes them from the rest of the possum family. When marsupials are born, they are extremely underdeveloped and they crawl, using their barely formed limbs, into the mother’s pouch. New born Sugar Gliders are about the size of a jelly bean, and spend several months attached to the teat in the marsupium. As they grow, they develop a furry, bushy tail and a black stripe that runs from the head down to the tail. 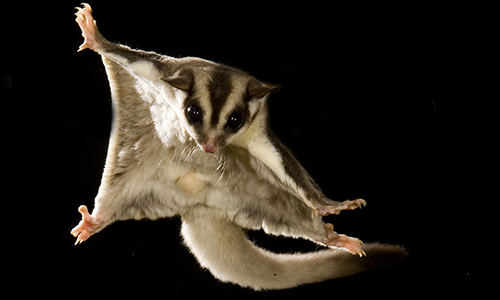 Adult Gliders measure in at around 15-20 cm long. Spotting them in the trees feeding on the nectar can initially be difficult - because they have a white belly that blends in very well with the white flowers – so it helps to have our Ranger ‘know how’ on hand. DID YOU KNOW Gliders have a membrane of skin called a petagium that extends from the wrists to their ankles that enables them to jump and glide through the air as if they are paragliding or base-jumping? As many of our regular readers know, Kingfisher Bay Resort was built to sit lightly on the land and allow Fraser’s wildlife to go about their daily business uninterrupted. From time to time we need to step in and lend a hand with our furry neighbours, as was the case recently when a guest let us know a baby Glider was making some strange noises just underneath the Centre Complex building. We promptly contacted a Certified Wildlife Carer and, following their expert instruction, rescued the little Gilder and popped in our Wildlife Rescue Box. Gliders normally feed on nectar and insects; however this baby did not have properly developed teeth and was unable to access its mother’s milk, we kept it fed on a diet of sugar water and fruit juice until we could relocate it to a care facility on the Fraser Coast mainland (see above pic). As you can see, this little fella won the hearts of all our team as it eagerly lapped up drops of apple juice out of the dropper. However, as we could not give it the care that it needed here at the resort, we gave it to a wildlife carer in Hervey Bay to look after… and from all accounts he is healthy and ready to head back into the wild. Stays tuned for next month’s update tree huggers and, for all those mad keen fisherman amongst us, catch Ranger Grant’s latest fishing update on our Life on Fraser blog.